In the contact center, the terms multichannel and omnichannel are often confused. 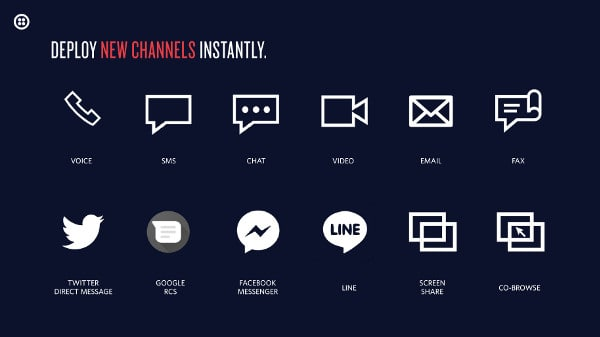 Many companies say they offer omnichannel communications, when what they really have is a multichannel approach. An agent who connects with a customer in a multichannel contact center by phone may not have any information about that customer’s previous interactions on another channel. Often in a multichannel contact center channels are siloed — agents can’t see the context from interactions customers had on other channels on their contact center dashboard, which limits the level of service they can provide. In an omnichannel contact center, however, all communication channels (such as phone, SMS, online chat, and email) are connected and integrated to provide a seamless customer experience. Omnichannel contact centers let agents switch between channels from one user interface without losing context from customer interactions across all other channels. For example, when a customer can begin with a chat session on a website and then roll that chat into a video co-browse session or voice call with an agent, that customer is having a seamless, omnichannel experience. Today’s customers want to communicate over multiple channels—whether it’s Voice, SMS, WhatsApp, or Facebook Messenger—they want companies to communicate with them on the channels they like to use. So how can companies create this experience for their customers? The answer lies in application programming interfaces (APIs): routines, protocols, resources, and tools developers use to create software applications. APIs are like building blocks. Using APIs, you can build an entire contact center from scratch, or simply add the features you want to the one you already have. Voice - Let customers reach you by phone or schedule a call back from your website or app. SMS - Provide direct messaging between customers and agents for quick resolution. Chat - Complete transactions and transfer rich, context-aware data over secure web chat. Video - Enable face-to-face conversations for identity verification, content sharing, or visual problem resolution—all within your app. Routing - Coordinate across all your channels with intelligent routing that prioritizes tasks from every source and sends them to the right agent. When choosing a contact center solution, look for a single interface for multiple channels — SMS, phone calls, in-app chat, email, messaging apps, and more — to save you the effort of maintaining separate integrations. You want to add new channels to your contact center as they become popular as well as create custom channels easily. Make sure the solution gives you complete ownership of your customer interaction data across all channels while providing a single omnichannel desktop to set your agents up for success. Twilio APIs are architected at every layer for handling an omnichannel system. To find out more, check out check out this interactive infographic: How to Future-Proof Your Contact Center with APIs.